The Walkie Scorchie can fry an egg, or ruin hair products. It's very versatile. 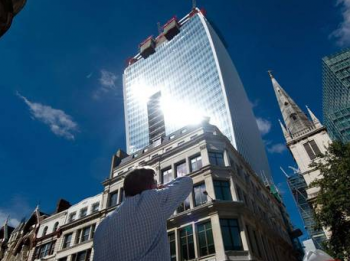 Spare a thought for architect Rafael ViÃ±oly, whose not-quite-finished skyscraper, 20 Fenchurch Street - aka the Walkie Talkie, for its distinctive look - has been setting London ablaze this week. Glare from the sun, reflected off of its glass frontage, has been burning up the City. Jaguars have melted, hair products have been ruined, and some have successfully fried eggs in the reflected rays of the Scorchie. Though the developers claim this is a temporary setback - "the current elevation of the sun in the sky," rather than the building's design, is to blame - a six meter high scaffold with green and black wire netting has been erected, to save London from the worst of the Walkie Scorchie's effect. It's believed that covering the glass in non-reflective film will solve the problem for good. "I could smell burning, so I thought some of our equipment had malfunctioned and set on fire," said one witness to the Scorchie's rays. "But then a customer pointed out that our carpet was smoking and a chair was beginning to wrinkle in the heat, caused by the concentrated sun coming through the window." This isn't the first ViÃ±oly building to have death ray associations; his Vdara Hotel, in Las Vegas, is reported to have set newspapers - and a lawyer's hair - aflame. In the case of the Scorchie, it may not be all ViÃ±oly's doing. The original design called for a series of balconies along the frontage which would have mitigated the mirror effect, but those balconies were cut from the plans at an early stage of development. In the meantime, imagine the joy of those developers, now faced with the prospect of covering 57 stories worth of glass in non-reflective screen. Still, it could have been worse. "When I once described Rafael ViÃ±oly as a menace to London," George Ferguson, former president of the Royal Institute of British Architects, Tweeted, "I didn't think he was going to burn it."